Heat a large, heavy-bottomed skillet to medium-high and add 2 tablespoons oil. Season beef pieces with flour, salt and pepper and sear, making sure all sides of the beef pieces get browned. Transfer beef to your slow cooker. Add remaining oil and cook onion until the edges begin to brown, about 5 minutes. Add garlic and cook for 30 more seconds. Add a splash of the beef stock to deglaze the pan, making sure to scrape up all the brown bits from the bottom of the pan with a wooden spoon. 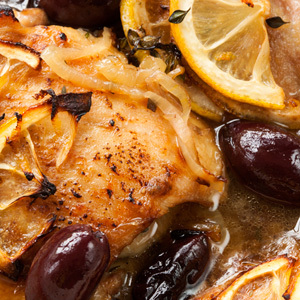 Pour contents of pan into your slow cooker. Add sweet potatoes, carrots, tomatoes and tomato paste, remaining stock, bay leaves and thyme leaves to your slow cooker; stir to combine. 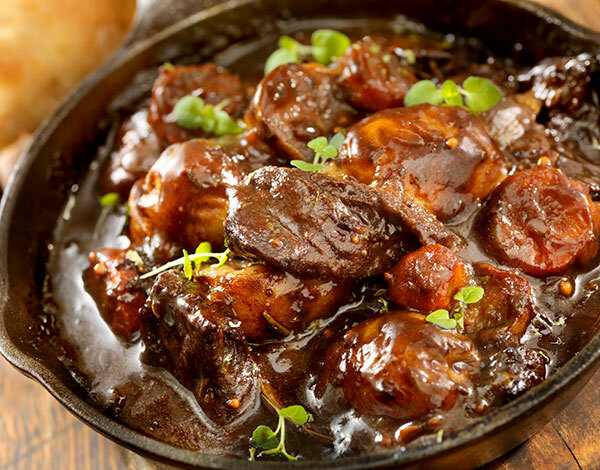 Cook stew on low for 7-8 hours or until potatoes and beef are fork-tender. Garnish with thyme leaves and serve warm. Don't let the cold weather pass you by without making this rich, hearty and flavorful beef stew at least once. Tender sweet potatoes combined with falling-apart beef pieces make for a crowd-pleasing feast; we particularly love this stew served over steamed rice or with lots of crusty bread for mopping up all of the glorious stock! This recipe makes 8 servings.